Wheat and rye are both grown as food plants for human consumption as well as animal fodder. Both wheat and rye are used in baking, since they contain gluten, a protein that causes bread to rise. Both grains are also used in the production of beer and distilled spirits like whiskey. Wheat and rye are cereal plants, which are grasses. These grasses produce seeds that are an excellent food source for humans and animals. The grains have edible inner portions called the endosperm, germ and bran. Typically, only the endosperm is used in processed foods. Wheat germ contains vitamins and fiber, and is often used to boost the nutritional content of foods. The bran is the outer layer of the grain and contains fiber and some fatty acids. Wheat was one of the first grains to be cultivated in ancient times. It grows in temperate climates and represents the third-largest crop in the world, but according to the website Gramene, it feeds more people than any other grain. Wheat is grown primarily for food, but it’s also used in animal feed and for brewing and distilling. Most commonly ground into flour, wheat is used to make pasta, bread, breakfast cereals, and is an ingredient in many other prepared foods. Wheat is classified into winter and spring cultivars, as well as hard and soft varieties. Rye is a cereal grain like wheat, which is a close relative. It’s a sturdy plant that grows well in cold climates and is tolerant of frost and drought, making it possible to grow rye where wheat will not survive. Rye is used both for human consumption and for animal feed. 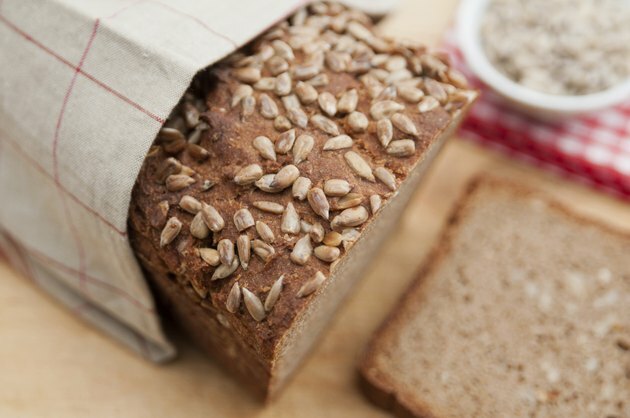 The most common way of eating rye is to grind it into flour and use it for bread. Rye is also used to make whiskey and some types of vodka. Wheat and rye were crossbred to create the hybrid grain triticale, which was first grown in 1875 and only became popular during the 1930s. Triticale inherits the best qualities of its parents: like rye, it is cold hardy, disease resistant and can grow in poor soils; and like wheat, it yields large crops. Triticale is mostly used as animal fodder, but can also be found in specialty grocery stores. Plant breeding programs have developed both winter and spring types of triticale. Rye provides carbohydrates, plenty of fiber, as well as vitamin E; the B vitamins thiamine, riboflavin, folic acid, and pantothenic acid; the minerals calcium, potassium and iron; and phosphorus. It has less gluten than wheat. Significantly, rye provides a complete amino acid profile. Wheat also provides complex carbohydrates, fiber, and vitamins and minerals. Wheat is an incomplete protein; while it contains all eight essential amino acids, it does not contain them in adequate amounts for good nutrition. Hard wheat varieties contain more protein than the soft wheat varieties. Wheat contains gluten, which makes it ideal for baking. Triticale has a lower gluten content than wheat but is higher in protein than either of its parent plants and contains a significant amount of the amino acid lysine.